The best parts about the popular re-designed 2018 Honda CR-V are back again in the 2019 model that is now available in an all-new Platinum White Pearl color option. 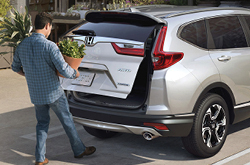 With more cargo space than ever and tons of interior options, families looking for a safe and dependable crossover will love the 2019 Honda CR-V. The 2019 Honda CR-V is available in four different trim options: LX, EX, EX-L, and Touring. The Honda CR-V has something for everyone with modest, yet functional features in the LX model to luxurious accommodations and tech in the Touring model. The base LX model features a 5-inch touchscreen display with hands-free capabilities and fold-flat 60/40 split rear seats for maximum storage. The LX also comes equipped with LED daytime running lights and is available in all-wheel drive. 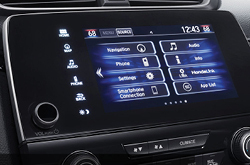 All models above the LX include a 7-inch touchscreen display, are compatible with Apple CarPlay and Android Auto, and come with Honda Sensing technology standard. For those in the market for a more luxurious feel without sacrificing utility, the EX-L model comes equipped with leather seats and steering wheel, automatic dimming review mirror, adjustable power seats and power tailgate, a high-quality audio system and more. The top Touring model includes a hands-free power tailgate, LED headlights, a 330-Watt Audio System, in-car navigation, and rain-sensing windshield wipers. All models are available in all-wheel drive. How is the Performance of the 2019 Honda CR-V? 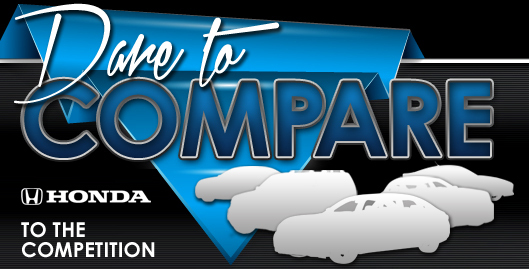 The LX model comes with a 184 HP, 2.4 liter 4 cylinder engine, a standard Honda engine that has stood the test of time. The EX, EX-L and Touring models come standard with a 190 HP, 1.5 liter 4 cylinder turbocharged engine that boasts 179 lb-ft. of torque. All models are equipped with CVT automatic transmissions which make driving the 2019 Honda CR-V incredibly smooth and easy. All models also come with Eco Assist, helping to increase fuel efficiency, and drivers can expect a combined MPG of approximately 28 miles per gallon with the 2019 Honda CR-V. If safety is your main concern, the 2019 Honda CR-V is a top-rated vehicle and will provide you and your family with peace of mind. All models, except for the base LX model, come equipped with standard Honda Sensing driver-assistive technology that is always looking out for your safety. 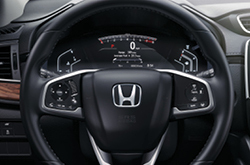 Some of the features of Honda Sensing technology includes automatic braking, assistance with staying in your lane, adaptive cruise control and alerting you if you begin to veer off the road. Visit our dealership in Delray Beach and take a test drive.